By the end of 2017, we moved with our team to a bigger space! Why? Well, we were planning to expand our team. We were not entirely sure how fast, but in January we were a team of four, and now we are a team of 13 from many different nationalities! Once more, our office is too small. Our current office is only 45 square meters so it is quite busy! Lucky enough, many of us are continuously on the road visiting our clients, maintaining some of our projects, delivering hrbs or acquiring new projects. 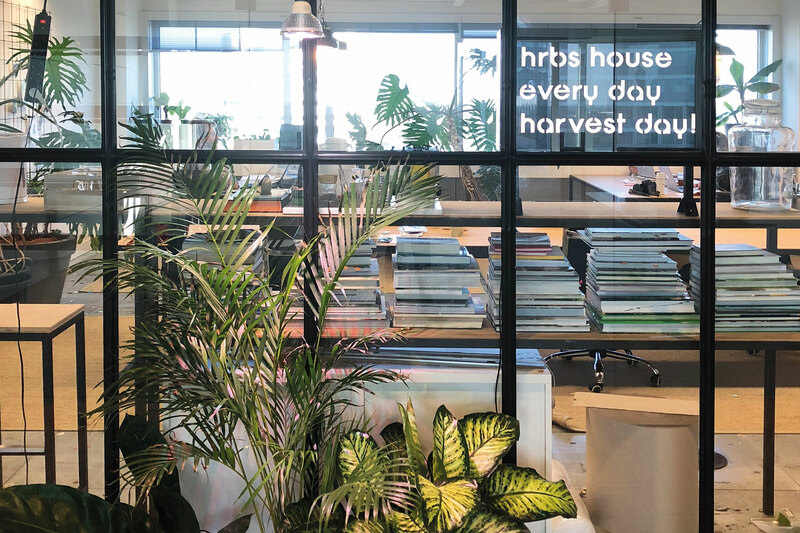 The office is teeming with plants, fresh herbs and books about landscape, plants, green design and urban farming. 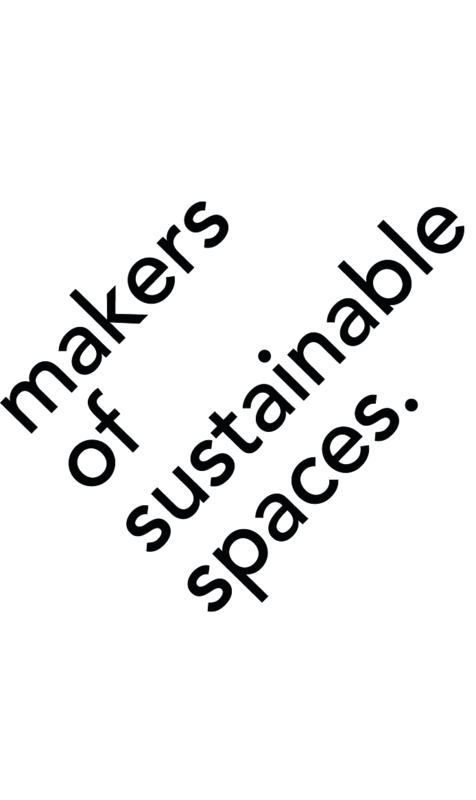 A part of our team is focussing on MOSS (Makers of Sustainable Spaces). We can proudly say that the projects we are working on are so challenging and exciting. We have the opportunity to work with amazing clients like; booking.com, CBRE, Aldin, Elho and many more! The other part of the team is working incredibly hard to make hrbs THE online order service platform for fresh hrbs and mini vegetables. Our motto? Every Day, Harvest Day! Every day we’re working to solve challenges regarding logistics, operations, design, sales, nurseries and the development of our online platform. To explain a bit better how projects develop or processes go we will take you through two projects! In the beginning of this year, we were selected as the agency responsible for the ‘green layer’ of the new Booking.com HQ in Amsterdam. The design by UNStudio will be the home for almost 4000 Booking employees. We were not the only team selected for further development of this campus. 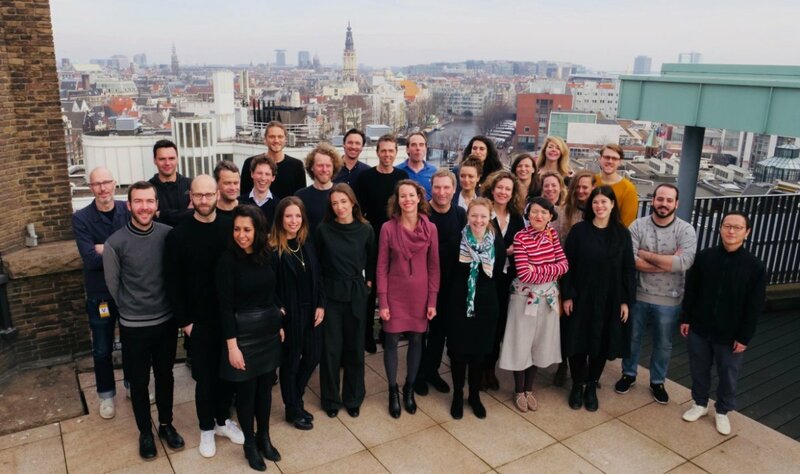 Inspiring agencies such as Hofman Dujardin, i29, Meijksenaar, CBRE and Studio Modijefski are also developing certain layers or areas in the building. The coming months, we are focusing on collaborating with the interior designers and architects to create a plan where green is involved based on our masterplan and the MOSS Manifesto. Within this plan, we take into the account the feasibility, the green impact, the typology of green, construction requirements, installation and maintenance. At the Circl Pavilion in Amsterdam we have placed one of our hrbs. hardware solutions; the Hrbs. House. The House is piece of furniture with a water basin and an integrated grow light. The house provides space for 15 trays of fresh herbs and mini crops. Together with the chef, Rudolf Brand we have selected the different herbs best suiting their menu. Every two weeks we deliver a fresh order and take back the old trays and bring them to the nursery. Our circular concept perfectly fits the circular pavilion and adds to the experience of fresh food and drinks. SO WHO ARE THE PEOPLE WORKING ON THESE PROJECTS? First of all, we think they are amazing, incredible smart, motivated, inspiring and have all loads of love for everything that has to do with green! Meet for example Michiel van Zanten! Michiel van Zanten has worked for years at Ahold as a strategic sourcing manager but was ready for a new challenge and we are so happy he found us! Where you from? Heeze, a small village down South. We (Heezenaren), like to call it “the pearl of Brabant”, which it is…..
What do you do at MOSS / HRBS? I’m Operational Manager, I make sure our supply chain is becoming more professional and sustainable every day. Why do you love plants? Plants make me quiet and at ease, which for people who know me is quite an achievement. What is your favorite spot in Amsterdam? Beatrix Parc (A’dam south) at the back of the RAI-building. There in the park is a great herbs garden. Very few people know it, but its nice quiet area, where people can touch, see and read about all kinds of different herbs. The great thing about it, it’s free to walk trough. Fun fact / nice to know about you: I like to build things from wood, all my kids (3x) sleep in a bed I made with my own hands, perhaps not such a superb craftsmanship, but it gives great satisfaction and my kids tell the whole world that daddy made it. Meet also Claire ‘Kelai’ Diebel! Kelai has seen almost every possible urban farming project in this world and started in 2017 with an internship at our office! Well, we can tell you, this worked out pretty well and now she and her positive energy is indispensable for our team! Where you from? I was born in Kansas City, but a part of me is from Shanghai. What do you do at MOSS / HRBS? I’m applying insight from years of green infrastructure research to constructing city farms and urban oases. Why do you love plants? Physically speaking, because life depends on them. Aesthetically speaking, because I’ve never found something more beautiful than plants! Fun fact / nice to know about you: I speak 5 languages. Wanna meet more of our people? Follow us on Instagram: moss_amsterdam and hrbs_nl and we will introduce them soon to you! Keep following us! In our Next blogpost, Philip van Traa will bring your attention to the global food system ! Hey Green Works! Biophilic Design in the Workplace.